Silent in the Shadow of Night. There is something about an old abandoned farmhouse sitting alone surrounded by circle of old maple trees and miles of farm field. A long dirt road leading up to an old war torn bridge and barns that house some very interesting histories to them. 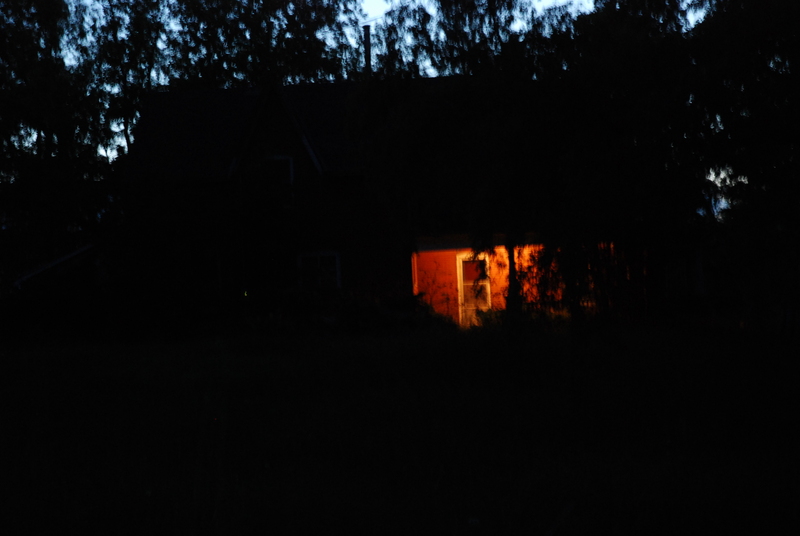 Never really noticed while driving along the main country road at night, as it looks like any other farmhouse. The porch light on at night, but this light is not on indicating life is housed within it’s walls, but to ward off any curious beings from trespassing through it’s now abandoned empty shell. Upon a closer look, which I took a few years ago simply by stumbling upon it. The grass and weeds have begun it’s reclaim around the house, the many years of changing weathers have beaten it’s once armored walls. The painted wood porch has slowly began to sliver and peel, inviting hoards of leftover bee’s nests dried up in the corners. Mid afternoon, I drove the car to about the midway point of the old dirt driveway, almost up to the old wood bridge. I didn’t trust it, didn’t look to healthy. I walked the rest of the way. The sun shining, the birds chirping and the fall winds were warm. I had originally wanted to take photos of the area as it intrigued me. First was to see if there was anyone still living there. As I approached the front steps and eventually up to the front door. I first peered into the the door’s big window. Nothing, no furniture, no living in sight. Then I circled the house house and discovered that the back kitchen door had been left open. Of course curiosity caught this cat’s eye’s and I entered. Still with photography my main focus, I took pictures as I made my way inside. As the door closed behind me, I noticed the dying beeping of an old smoke/fire alarm indicating the batteries were on their last legs. “Hello” I yelled out, “Is there anyone here?” I followed with. Nothing, just pure silence. The inside was in great shape, though there was noticeable water damage beginning on areas of the walls. The paint was peeling all around, falling to the wood floor. There were two staircases, adjacent to one another almost running under one another with only a room in between. I proceeded up the front stairs to the upper level and as I made my way to the top of the stairs, it started. It sounded like it was coming from the attic just above me, walking or movement. As I started to look around, it seem to follow me above. Though a bit unnerved, I though maybe just a huge animal, maybe a raccoon or something along those lines. Still as I wandered through the different rooms investigating the top floor’s maze of a layout, whatever was above in the attic continued to follow. Then I made my way to the one front room, just above just inside the door, the entrance to the attic. As I entered the room and looked up, I felt it’s presence there on the other side of that attic hatch. It was intelligent, seemingly big and now very silent. I snapped some final pictures and made my way back down to the main floor. The whole time in there I noticed a very overwhelming sense of dread or negativity. Something that has been a common energy for all that have entered during our many investigations after my initial visit. Since then through researching it’s past, there have been a few details that have come to light through several avenues. Some of the more notable being the suicides of two women on two separate occasions. One from the antenna atop the roof and the other from somewhere within the walls of the main barn. In fact I remember the first visitation there and noticing the police tape still in one stairwell leading down to the lower stable of the barn. Upon investigations, several unnerving EVPS have made their presence. One even calling my name as I was walking down the front stairwell. Chilling, though something about it’s presence draws us back. In fact just days ago, we visited and once again it seem to bring an mysterious atmospheric aura out. One that has along with the time of the year wanting to explore the unknown once again!